16 January 2018: Brittany Ferries has today announced the launch of a new route that will link Spain and Ireland by ferry for the first time in history. It comes in a year when the company is celebrating 40 years of operations from the UK to Spain and will be the twelfth route in a network linking the UK, France, Ireland and Spain. The service will sail from Cork in Munster to Santander in so-called “green Spain” and will start at the end of April, making two return-sailings a week. A new ship will be chartered for the service which will also deliver an additional weekly return-sailing from Cork to Roscoff in France. She will be called Connemara and will follow the successful économie model that the company has established on services from its UK hub in Portsmouth to Spain and Normandy. The ship is currently serving routes between Italy and Greece and will be chartered from Stena RoRo for an initial period of two years. She will carry up to 500 passengers with space for 195 cars. She hosts 2,225 lane metres of garage space and Brittany Ferries expects a fifty-fifty split between passengers and freight carried. On board, passengers can expect a comfortable, no-frills service with a distinctly Spanish theme. Dining options will reflect the regions served, reinforcing the company’s drive to reveal more about its destinations at every stage of the journey. There will also be a small shop and café-bar as well as comfortable passenger lounges. Brittany Ferries’ head office is in Roscoff, France. But its travel hub is based in Portsmouth which serves four destinations in France and two in northern Spain. At the height of summer Portsmouth hosts up to ten departures a day, including a fast ferry which makes twice-daily crossings to Cherbourg. Around seventy percent of the total 2.5 million passengers carried by the company each year pass through the port, as well as around eighty percent of total freight carried. 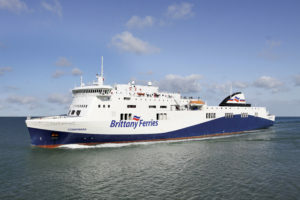 In addition to Portsmouth, Brittany Ferries sails from Poole to Cherbourg (and Poole to Bilbao freight-only), and from Plymouth to Roscoff and Santander.